This workflow shows a high level view of Published Rates and the order of events to successfully create rate requests, rates, and book the selected rate. We call out the specific parties involved during each step of the process. If you have questions, don't hesitate to email us at api-support@uship.com. Keep your account manager in the loop for the best integration and support experience. Authentication When making v2 requests, follow the password grant flow outlined in Authentication. a) A Shipping Customer initiates a rate request with a valid JSON input body that includes listing details. b) A Service Provider receives a rate request notification via their recipient URL. b) A Service Provider receives a rate acceptance notification via their recipient URL. A Service Provider accepts or denies the rate they provided. Currently, the response is manually done on uShip.com. Eventually this confirmation step can be automated. 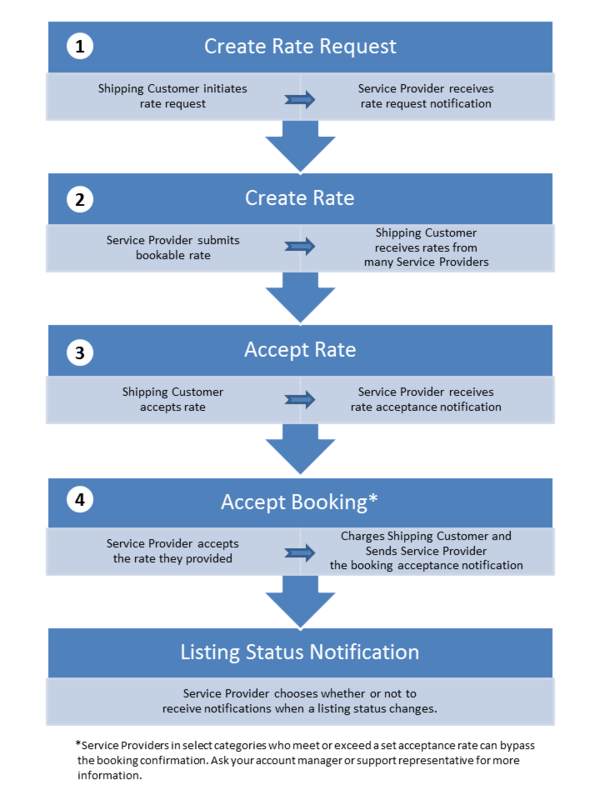 If the Shipping Customer's payment method on file is successfully charged, then the Service Provider receives a booking notification with the booking details. If the Shipping Customer's payment method is declined, he or she will receive an email or notification indicating that he or she must resubmit a valid form of payment for the booking. At that time, the shipment becomes active / available in the uShip marketplace and the booking request is no longer pending. Optional. A Service Provider receives a listing status notification when the Shipping Customer updates the listing.